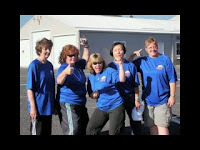 My team - the MissFit WiseWalkers - made an awesome showing at this year's Cascade Lakes Relay in Central Oregon. 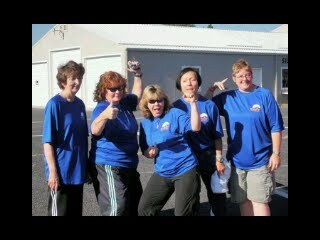 We completed the 132.4 miles walking course in an hour and sixteen minutes less than we did last year. We were last in our division - and that's okay. We were only seven minutes and a few odd seconds behind the next to last team - which is really good. Our average pace was only three-tenths of a second (!!) slower than that team. We all came through it feeling pretty good - some aches, a few blisters, a little stiffness = normal parts of doing a distance relay event in the mountains of the desert in the summer for 32+ hours straight. I arrived home Sunday night to discover my car battery was dead and my cat was dying and then my partner's car wouldn't start in the vet's parking lot. There is more to that story, which will have to wait. Someday the pieces of that string of events will be funny - but I need more time. Our living room currently houses the storage boxes with the team's supplies and my personal items from being the Team Captain for the relay; with the "welcome home" events last night and then work today I haven't had time to put them away. The dining room has been strewn with art supplies and outfits and my partner's personal items, who is flying out tomorrow morning to teach and take classes an art conference. We are a whirlwind of activity. Thank goodness the writing conference I am attending and volunteering at is local and needs no supplies. My life is very full right now - of good things. Minus one old part-Siamese tortoise shell tabby, who I miss. Sophie was so pretty! So sorry for your loss. So sorry to hear about Ms. Soph.